Books for Trade: Ophelia Press Paris. A short list of duplicate titles. October 5, 2015 October 5, 2015 / Steve M.
With a number of new items coming into the collection, it is time to list the rest of my Olympia Press duplicates, and remind everyone of all the others already listed, Over the 4 month lifetime of this blog it has become fairly obvious that there is little interest in the Olympia Press titles, primarily I suspect because they lack illustrations, however given that the stated purpose of the site is to assist in completing my collection of Paris Olympia Press titles, I shall get back on task occasionally. And so to that end I am featuring a very short list of Paris Ophelia Press imprints, you will sometimes see these titles listed by dealers as competitors to the Paris Olympia Press, when they are in fact a sub series.Sometimes noted as the poor relative of the Traveller’s Companion Series, if they have a common theme, it is that flagellation features strongly in nearly all in this series, my own collection of these titles is complete, barring the elusive “Springtime in Paris” linked at the bottom of this page. As always these titles are available to trade against my Paris Olympia press wants. COUNT | PALMIRO VICARION | LUST | OPHELIA PRESS Collation: 224 pp. 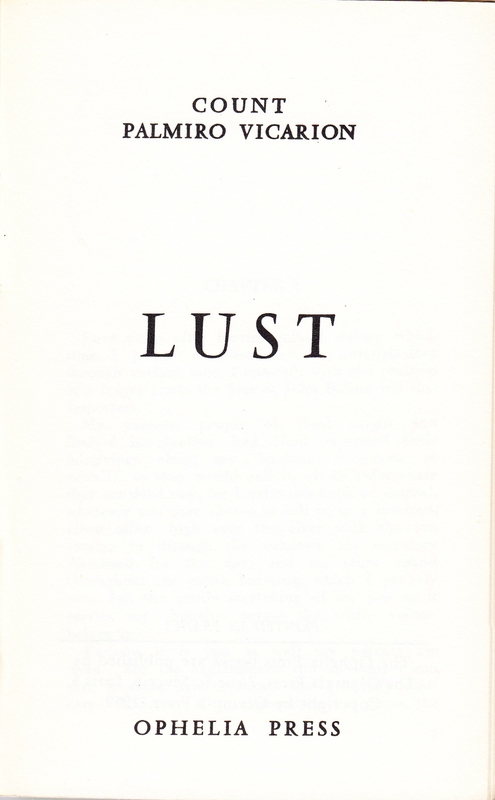 1 – LUST 148. 17.3 x 10.8 cm., all edges trimmed. Printed on white wove paper. Contents: pp. [1,2] blank. p.  LUST, reverse blank. p.  title, as above. p.  PRINTED IN FRANCE | [rule] | The Ophelia Press Books are published by | The Olympia Press, 7 rue St. Séverin, Paris 5. | Copyright by Olympia Press, 1959. pp. 7-218, text. p.  Printed May 1959 by S.I.P., Montreuil, France | Dépôt légal : 2e trimestre 1959 . pp. [220-224] blank. Binding: Pale tan wrappers, printed in black, and trimmed flush with the body of the book. [Front cover; within a vertical three-line oblong frame:] COUNT | PALMIRO VICARION | LUST | [outside frame, at foot of cover:] OPHELIA PRESS. [Spine; author and imprint printed horizontally across head and foot, and title lettered vertically up spine between them:] COUNT | PALMIRO | VICARION [-] LUST [-] OPHELIA | PRESS. 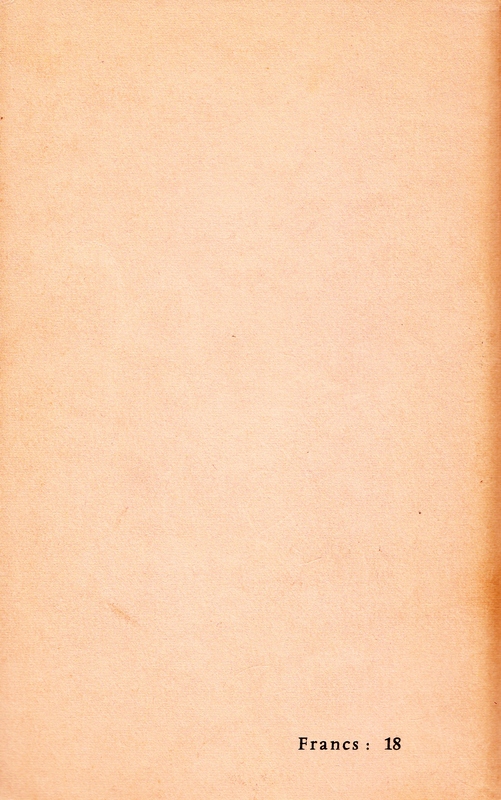 [Back cover, at bottom right-hand corner:] [price in bold] FRS. 18 | NOT TO BE SOLD IN | THE U.K. OR U.S.A. Notes: (1) A photo-offset reproduction of the first printing, and identical in all respects to it except for the printed price increase on the back wrapper and the visibly darker and inferior quality of the printing. It is dated c.1965 because it is priced the same as titles in the series known to be printed in 1965 (see 6.19.3, 6.20.2). No border on title page. 5 copies 4 Very Good 1 Good. [c1957?] 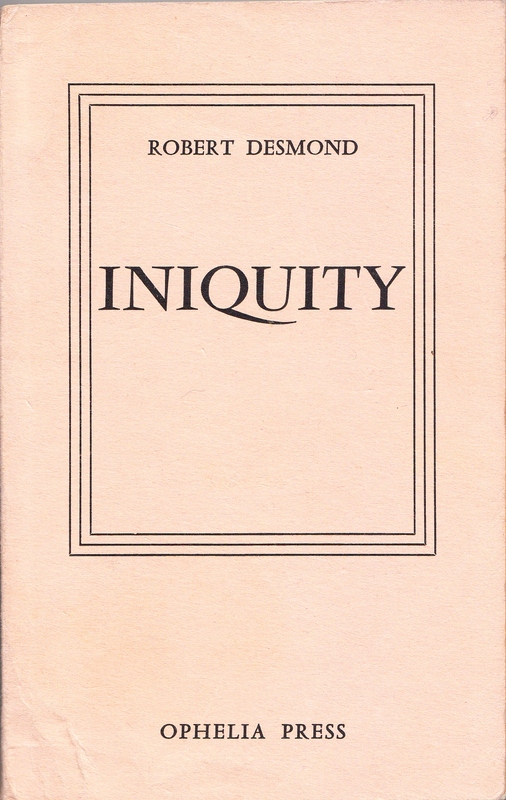 ROBERT DESMOND | INIQUITY | OPHELIA PRESS | PARIS Collation: 224 pp. No signatures, but [1-14]8. 17.5 x 110.0 cm., all edges trimmed. Printed on white wove paper. Contents: pp. [1,2] blank. 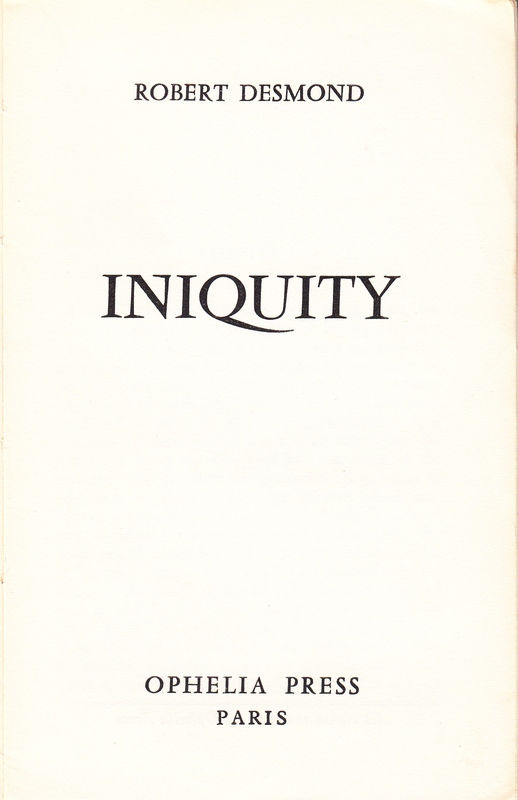 p.  INIQUITY, reverse blank. p.  title, as above. p.  PRINTED IN FRANCE | [rule] | All rights reserved by Ophelia Press. pp. 7-221, text. pp. blank. p.  « L’IMPRIMERIE DE LA SEINE » | 5, RUE GIT-LE-COEUR -PARIS VIe. p.  blank. Binding: Pale tan wrappers, printed in black, and trimmed flush with the body of the book. 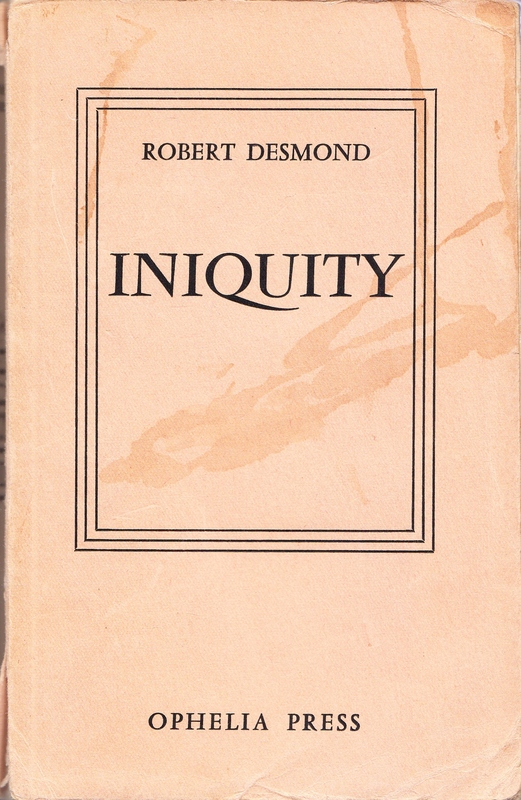 [Front cover; within a vertical three-line oblong frame:] ROBERT DESMOND | INIQUITY | [outside frame, at foot of cover:] OPHELIA PRESS. [Spine; the author and imprint lettered horizontally across head and foot and title lettered vertically up spine:] ROBERT | DESMOND [-] INIQUITY [-] OPHELIA | PRESS. [Back cover, at bottom right-hand corner:] FRS. 1.200 | NOT TO BE SOLD IN | THE U.S.A. OR U.K.
Notes: (1) The printer of this edition would seem to have been Bronislaw Kaminsky, aka Bruno Durocher (1919-1996) who founded Éditions Caractères in 1950 and had print shops at 5 rue Gît-le-Coeur, rue de la Harpe and rue Hautefeuille. 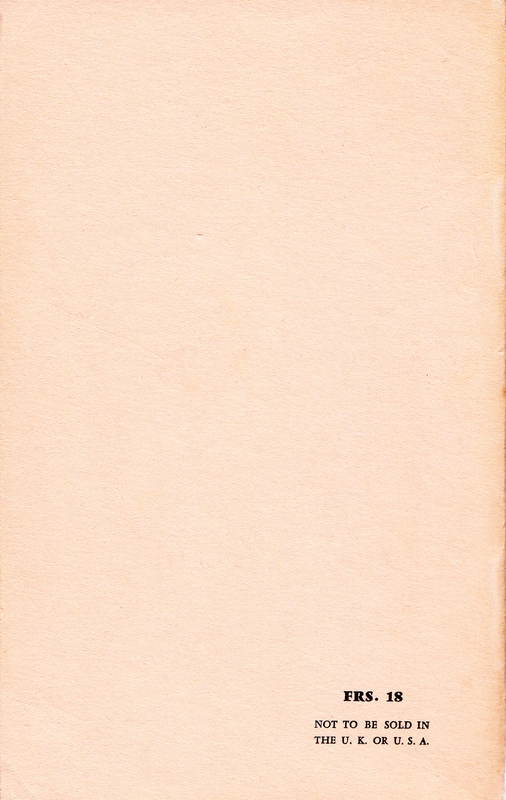 During the mid- to late 50s and early 60s a large number of English-language pornographic novels under various imprints unrelated to the Olympia Press emanated from these addresses, and as will be seen from the Introduction, The Castle of the End of Love, the chronologically unofficial first Ophelia Press volume, was printed by Durocher. 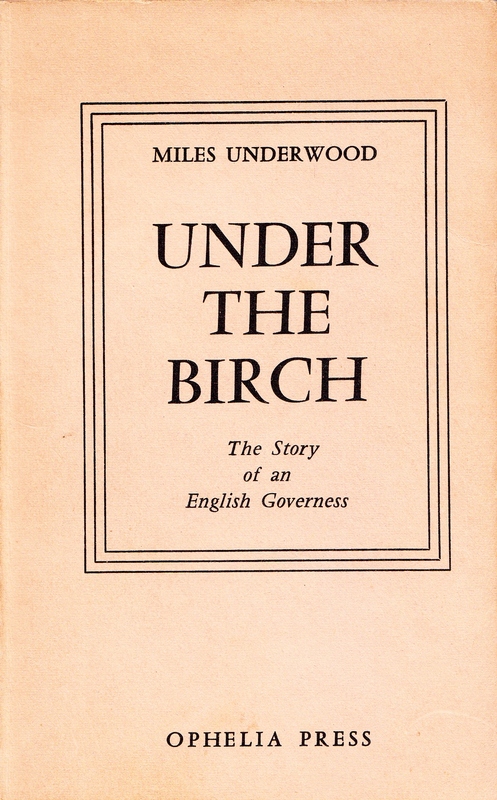 Miles Underwood [John Glassco], 1965 MILES UNDERWOOD | UNDER | THE | BIRCH | The Story | of an English Governess | OPHELIA PRESS Collation: 192 pp. GOVERNESS 1 – GOVERNESS 128. 17.4 x 11.4 cm., all edges trimmed. Printed on white wove paper. Contents: pp. [1,2] blank. p.  UNDER | THE | BIRCH, reverse blank. p.  title. as above. 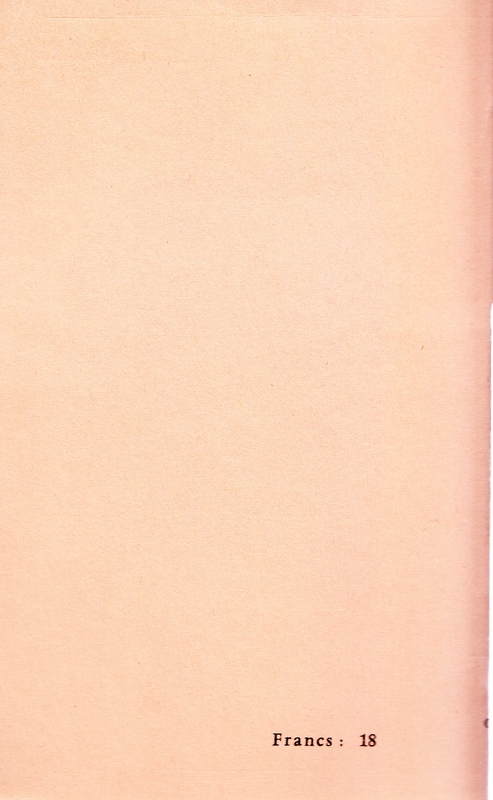 p.  Printed in France | by Imprimerie G. Frère, Tourcoing, June 1960. | Dépôt légal : 2e trimestre 1960. | New printing by Imprimerie Grou Radenez, 1965. | Copyright © by The Olympia Press, 1960, 1965. | [rule] | Ophelia Press books are published by | The Olympia Press, 7, rue Saint-Séverin, Paris-5e.ř pp. 7-186, text. p. 187 THE END. pp. 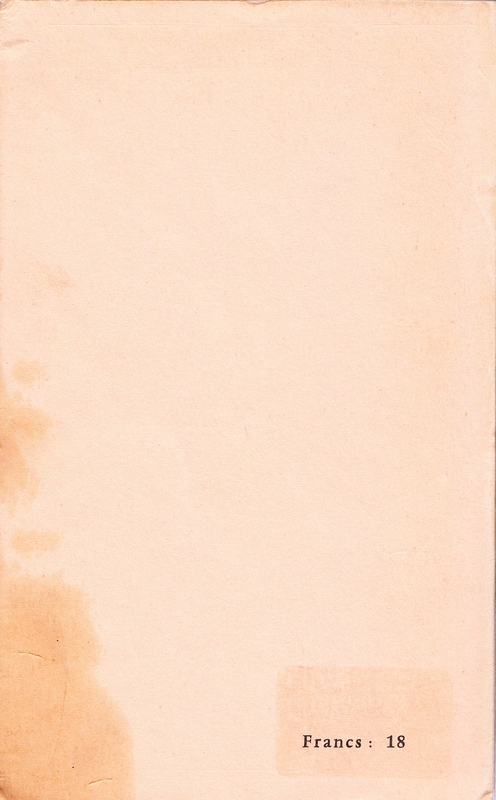 [188-192] blank. Binding: Pale tan wrappers, printed in black, and trimmed flush with the body of the book. 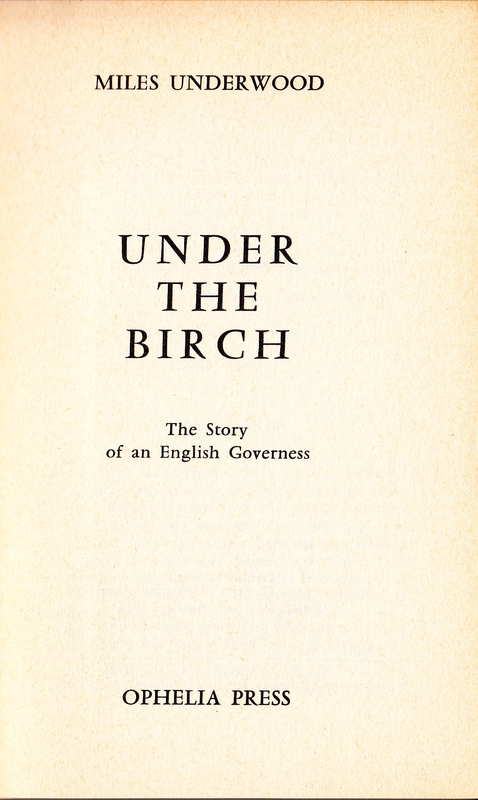 [Front cover; within a vertical three-line oblong frame:] MILES UNDERWOOD | UNDER | THE | BIRCH | The Story | of an | English Governess | [outside frame, at foot of cover:] OPHELIA PRESS. [Spine; author and imprint printed horizontally across head and foot, and title lettered vertically up spine between them:] MILES | UNDERWOOD [-] UNDER THE BIRCH [-] OPHELIA | PRESS. 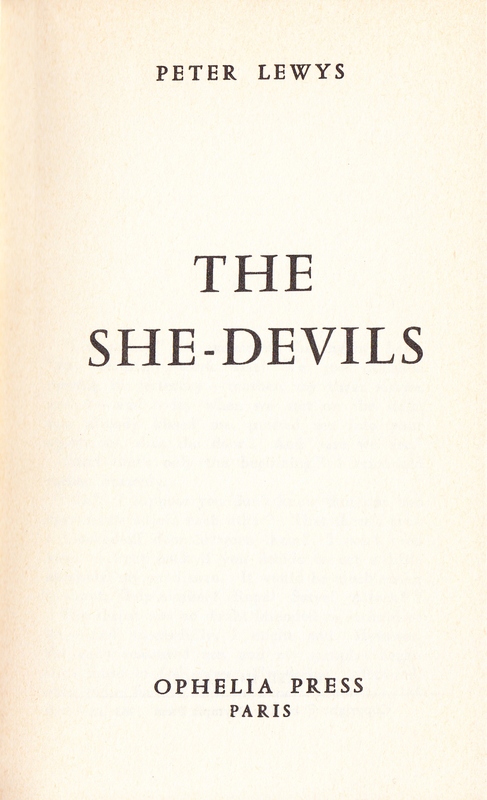 PETER LEWYS | THE | SHE-DEVILS | OPHELIA PRESS | PARIS Collation: 272 pp. Perfect bound; obsolete signatures from first edition retained. 17.4 x 11.0 cm., all edges trimmed. Printed on white wove paper. Contents: pp. [1,2] blank. p.  THE | SHE-DEVILS, reverse blank. p.  title, as above. p.  PRINTED IN FRANCE | [rule] | Copyright © by The Olympia Press 1965. pp. 7-, text. p.  blank. p.  GROU-RADENEZ, PARIS. pp. [270-272] blank. Binding: Pale tan wrappers, printed in black, and trimmed flush with the body of the book. 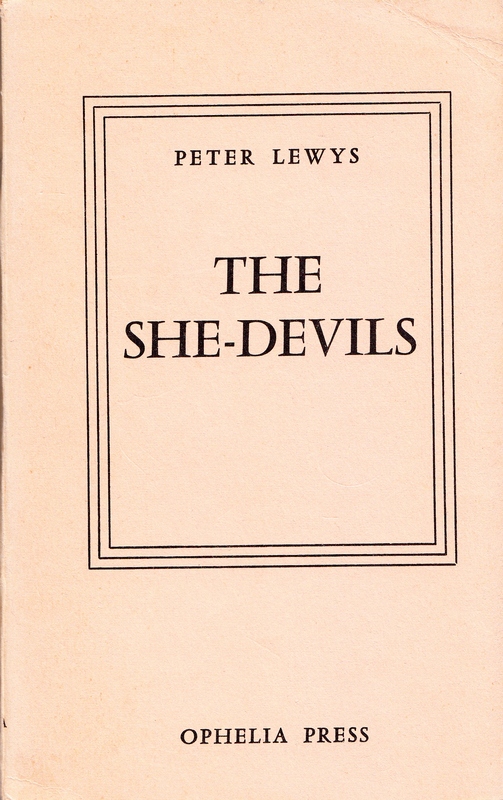 [Front cover; within a vertical three-line oblong frame:] PETER LEWYS | THE | SHE-DEVILS | [outside frame, at foot of cover:] OPHELIA PRESS. [Spine; author and imprint printed horizontally across head and foot, and title lettered vertically up spine between them:] PETER | LEWYS [-] THE SHE-DEVILS [-] OPHELIA | PRESS. 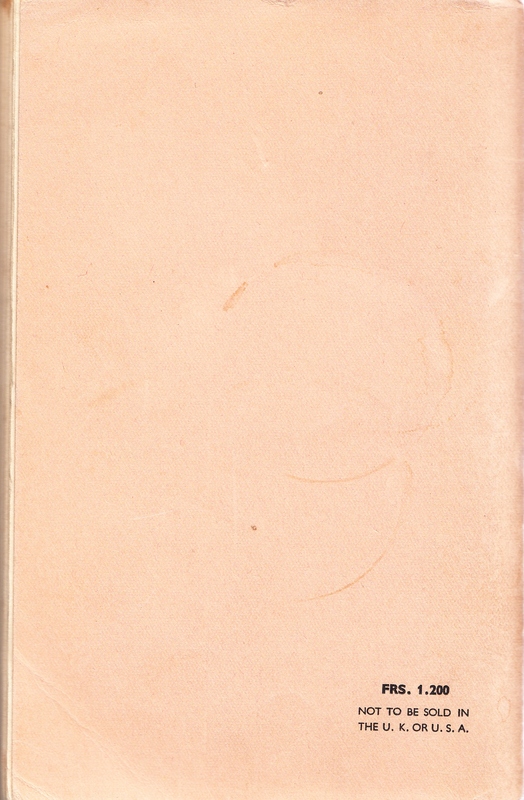 [Back cover, at bottom right-hand corner:] Francs : 18. 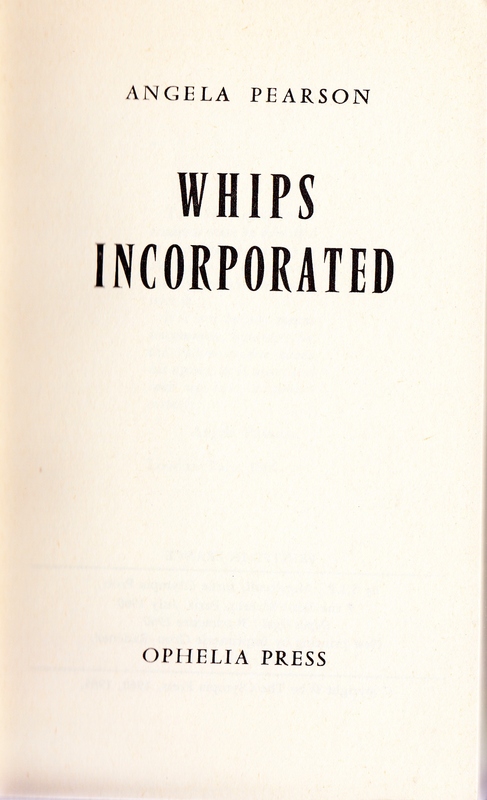 1965 ANGELA PEARSON | WHIPS | INCORPORATED | OPHELIA PRESS Collation: 216 pp. Gatherings as for 4.20.1, but first and last two printed signatures omitted. 17.5 x 10.8 cm., all edges trimmed. Printed on white wove paper. Contents: pp. [i,ii] blank. p.  WHIPS INCORPORATED, reverse blank. p.  title, as above. p.  PRINTED IN FRANCE | [rule] | by S.I.P., Monteruil, forhe [sic] Olympia Press | 7 rue Saint-Séverin, Paris, July 1960 | Dépôt légal : 3e trimestre 1960 | New printing by Imprimerie Grou-Radenez, | Paris, July 1965. | [rule] | Copyright © by The Olympia Press, 1960, 1965. p.  To the uninitiated | reader it must be admitted | at once that the ecstasy of | the whip is experienced | mainly by the one who | uses it… | It is not by any means | uncommon, however, for | the victim to rise above | his agony, as it were, and | soar up into a similar | ecstasy. | Angela Pearson | London-Paris, 1960. p.  blank. pp. 7-209, text. p.  blank. p.  THE END. p. [212-214] blank. Binding: Pale tan wrappers, printed in black, and trimmed flush with the body of the book. 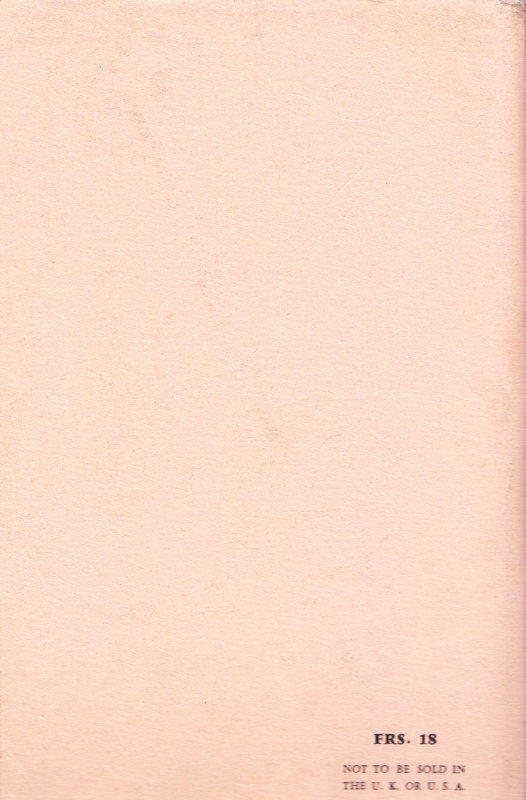 [Front cover; within a vertical three-line oblong frame:] ANGELA PEARSON | WHIPS | INCORPORATED | [outside frame, at foot of cover:] OPHELIA PRESS. [Spine; author and imprint printed horizontally across head and foot, and title lettered vertically up spine between them:] ANGELA | PEARSON [-] WHIPS INCORPORATED [-] OPHELIA | PRESS. Any questions please complete a Contact Form from the drop-down menu HOME PAGE.